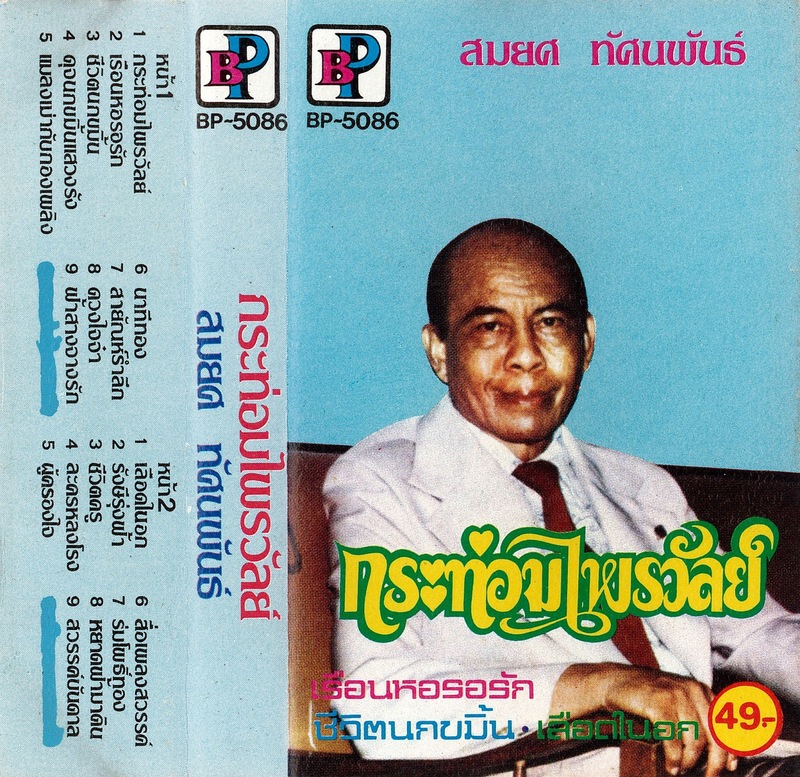 this week's cassette is part of a generous bequest gifted to us by educator cliff sloane, a former professor of ethnomusicology and founder of asianclassicalmp3.org, a major influence behind this blog. this week, another set of classics from the "man city lion", mr. chai mueangsing! chai grew up in singburi province, although he left for bangkok at a young age. in the city, he studied at a school of agriculture while he could afford it, but eventually dropped out to sing with local ramwong groups and work as a sign painter and market seller in talat phlu. 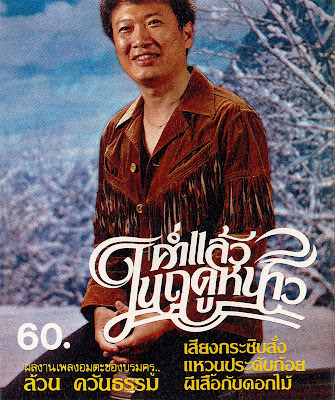 in the early 1960s he fell in with mongkhon amatayakun's famous chularat band and made his first recordings. audiences loved chai's odd voice, commanding stage presence and his good looks.. he even styled himself "the alain delon of thailand"! 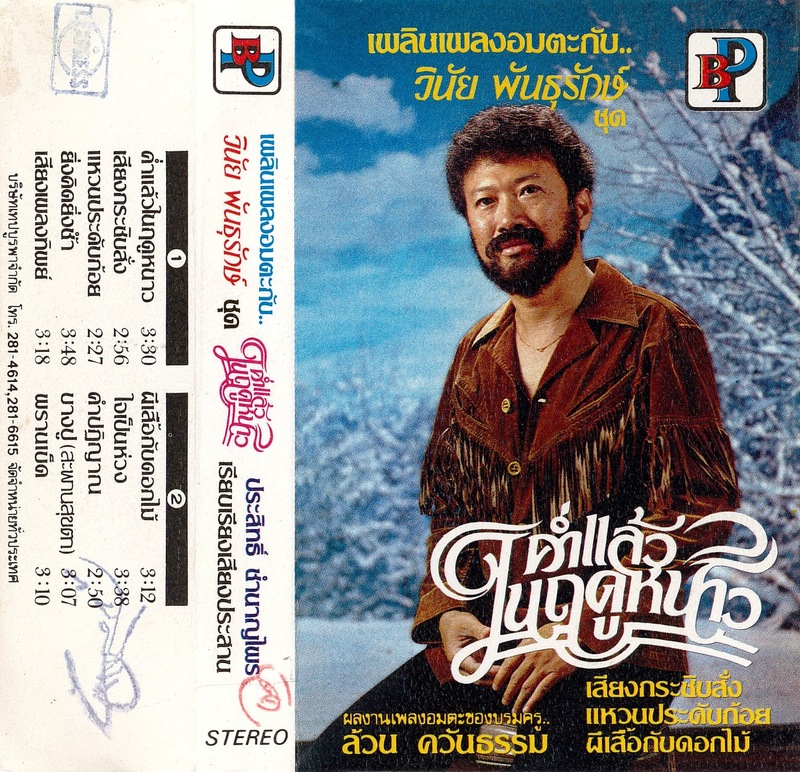 following a public dispute (maybe staged, maybe genuine) with fellow chularat member phon phirom, chai left the band to front a number of his own combos, playing mostly disco and lounge music under the name "man city lion" (the literal english translation of his stage name). eventually he left music altogether, heading home to become a farmer. in the late 80's, however, he returned to the stage to lead a luk thung revival, and today is recognized as a national artist of thailand. today's idiosyncratic compilation from the bangkok cassette co., ltd. (currently existing as maemaiplengthai), provides a snapshot from several stages of his career, from his early latin-tinged folk-pop, to driving rock'n'roll, to full-fledged disco.. enjoy! this week, we have part 2 of namphueng phet-uthai and her group's excellent ceremonial sounds! as namphueng's stage-surname suggests, our artists are based out of uthai thani province in thailand's central plain and specialize in music for any number of events where sacred sounds are required (at the time of writing, you can still book them to perform at your own event!). we've heard from these folks once before here, way back in 2010, when they provided a soundtrack to the thot kathin & thot phapa merit-making festivals. today, we join them at a tham khwan nak, or ordination ceremony for a novice monk. the group includes fellow singers la-iat luk-uthai and suwan kaeonam, performing poetry by sangwian miluenam. while the first side finds them backed by the "78 sound" piphat ensemble as in part 1, the second side finds accompaniment paired down to a more drum-and-fiddle-based group. enjoy! this week, we have some excellent ceremonial sounds from namphueng phet-uthai and her group! as namphueng's stage-surname suggests, our artists are based out of uthai thani province in thailand's central plain and specialize in music for any number of events where sacred sounds are required (at the time of writing, you can still book them to perform at your own event!). we've heard from these folks once before here, way back in 2010, when they provided a soundtrack to the thot kathin and thot phapa merit-making festivals. today, we join them at a tham khwan nak, or ordination ceremony for a novice monk. her prayuk group includes fellow singers la-iat luk-uthai and suwan kaeonam, backed by the piphat ensemble "78 sound", performing poetry by sangwian miluenam. unlike many tapes, where i've stumbled across a random numbered volume on its lonesome, cliff managed to secure both parts of this set, so next week we'll hear the second half.. enjoy, and stay tuned! this week, some brilliant southern folk sounds from songkhla! the musicians of the songkhla college of dramatic arts (which seems now to be defunct.. does anyone know the story?) bring us music from the dramatic dance genre of manora (or nora for short), performances of the jataka tales of manohara. the centrepiece of these acts is the elaborately costumed and often remarkably flexible dancers playing the role of kinnari (half-bird/half-human mythological creatures) [see j-card above]. the instrumental accompaniment is provided by thap (paired drums) plus one deeper drum, pi nai (oboe), nong (paired gongs), and assorted clappers, finger-cymbals, etc. occasionally joined by a vocalist. enjoy! 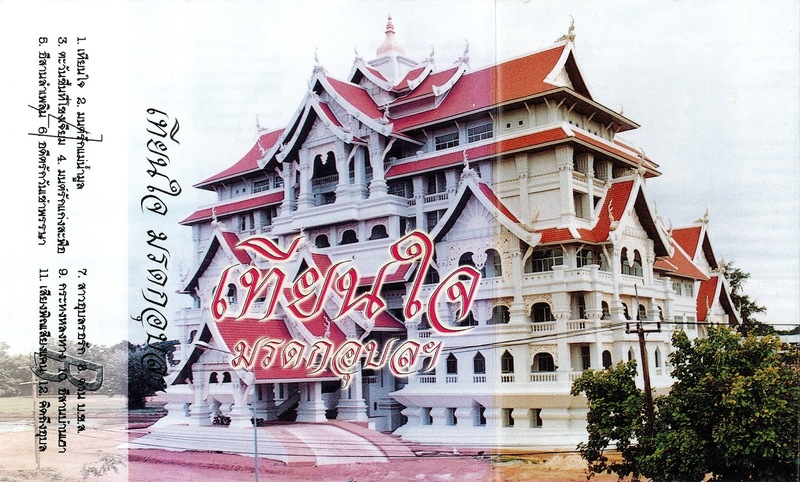 this week, we've got some more smooth sounds from mr. thanin intharathep! thanin is from samut sakhon, just outside of bangkok, and started out as a champion of local singing contests. he was discovered by pop impresario payong mukda, who got him in with suthep wongkhamhaeng's "suthep show" troupe. 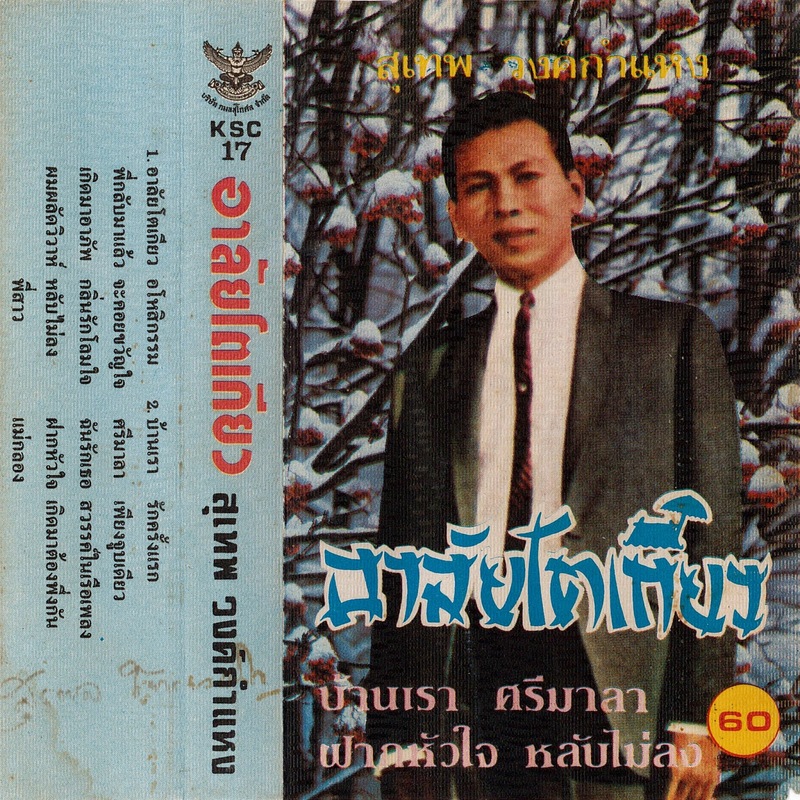 often billed as "thailand's frank sinatra", thanin brought a young, attractive face to the romantic, jazz-tinged ballads of luk krung, and is still a favorite among older bangkokians. this somewhat idiosyncratic compilation features a sampling of hits from several eras of his career: saccharine dance hall love songs, smooth 70s numbers hinting at funk, and more straight-forward big band pop, firmly in the luk krung tradition. among an album of romance, a rather unexpected entry is track 7, extolling the virtues of those in the journalistic trade.. enjoy! also, while i've never been one to go in for anniversaries, i just noticed while typing up this post that it marks a decade of monrakplengthai. 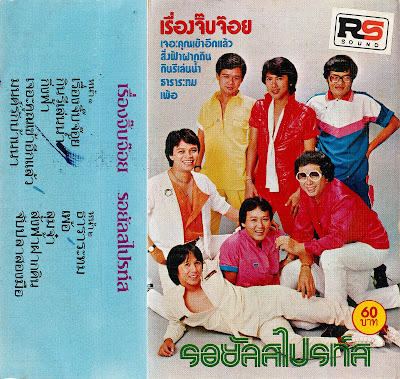 i promise that the "happy birthday" chorus that leads off this cassette was unintentional..
nutchari was born to a poor family in chonburi on thailand's eastern seaboard and got her start singing early. by age 5 she was performing at village festivities, and at age 9 she appeared onstage at a local concert of phumphuang duangchan. eventually she was asked to join anothai promotions, home of yingyong yotbuangam, and made her first recorded appearance with an answer song to the star singer. after that company folded, she joined with m-star to record the cassette we're hearing today. during this period she had become a close disciple of thotsaphon himaphan, and the influence of his lae-luk thung style can be heard on several tracks, especially the single (track 4). after this album, she left m-star for thotsaphon's four 's, at which point she really started gaining momentum: she was famous for her hectic schedule, often playing 4 concerts in a day. sadly, her career was brought to a tragic end after a traffic accident on tour left her incapacitated, with her face and voice forever altered. today, however, she's fully recovered and has even begun performing again. enjoy! 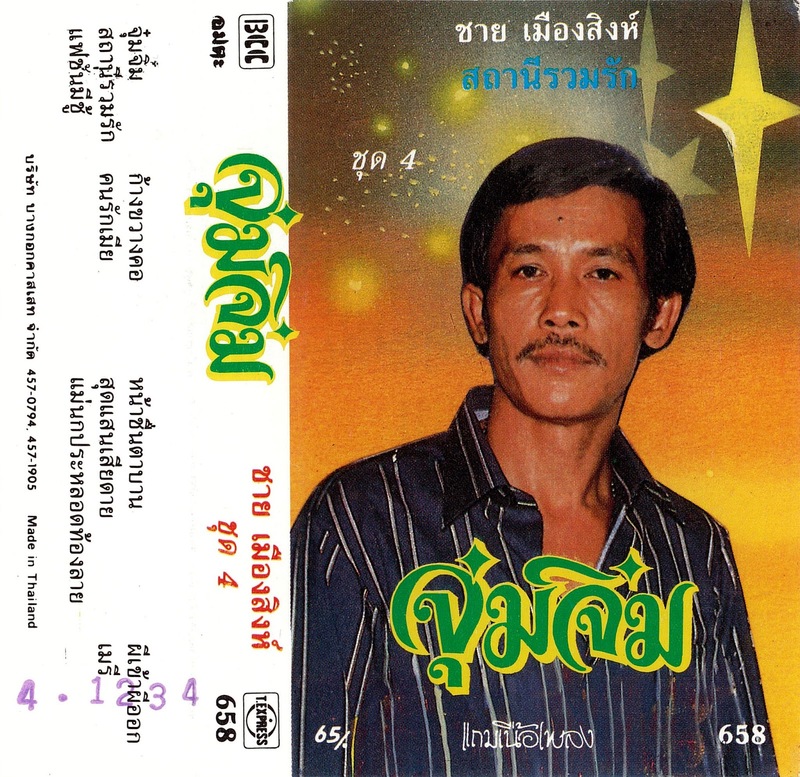 this week, 10 more solid-gold classics from mr. phloen phromdaen, the "king of talking music"! phloen grew up in aranyaprathet on the cambodian border, where he worked on his parents' farm. at age 20, a radio contest win landed him a spot in a local ramwong band. following that stint, he headed for bangkok to join the burgeoning luk thung scene, using his own savings to record original songs. eventually these sessions produced his massive hit "chom thung", which won him a spot among the biggest stars of the era, and even starring roles in several films. it was at this point that phloen became interested in comedy and inventive ways to incorporate clever wordplay and skits into his tracks. the result was phleng phut or "talking music", which is exactly what it sounds like: phloen will stop the music in the middle of a song to engage in witty asides with his bandmates. thai-language comprehension, of course, will help in appreciating the skits and the clever lyrics in general, but luckily the music is great on its own, featuring some of the hardest-hitting funk sounds to be found in 1970s thailand.. enjoy! this week, we'll hear our second entry from wara worawet! 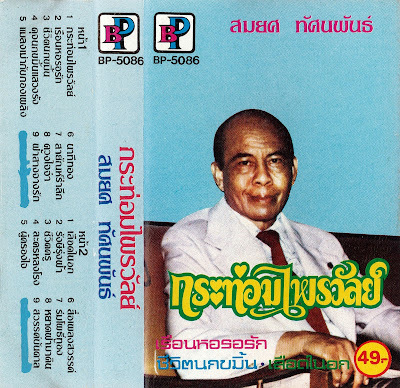 a physician by profession (graduating from the university of pennsylvania in 1961) mr. wara was also a prolific songwriter (having a number of luk krung & thai sakon-style hits to his name) as well as a leader of the musical association of thailand under patronage of his majesty the king. 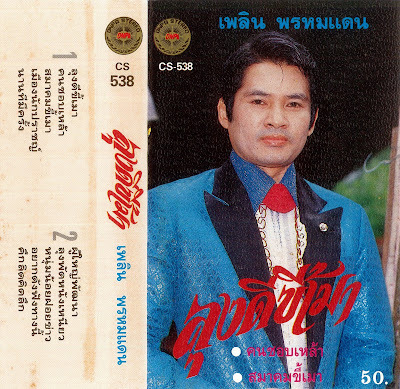 on this cassette, he tries his hand at the prayuk movement, a trend of "modernizing" thai classical music to appeal to an increasingly cosmopolitan local audience. 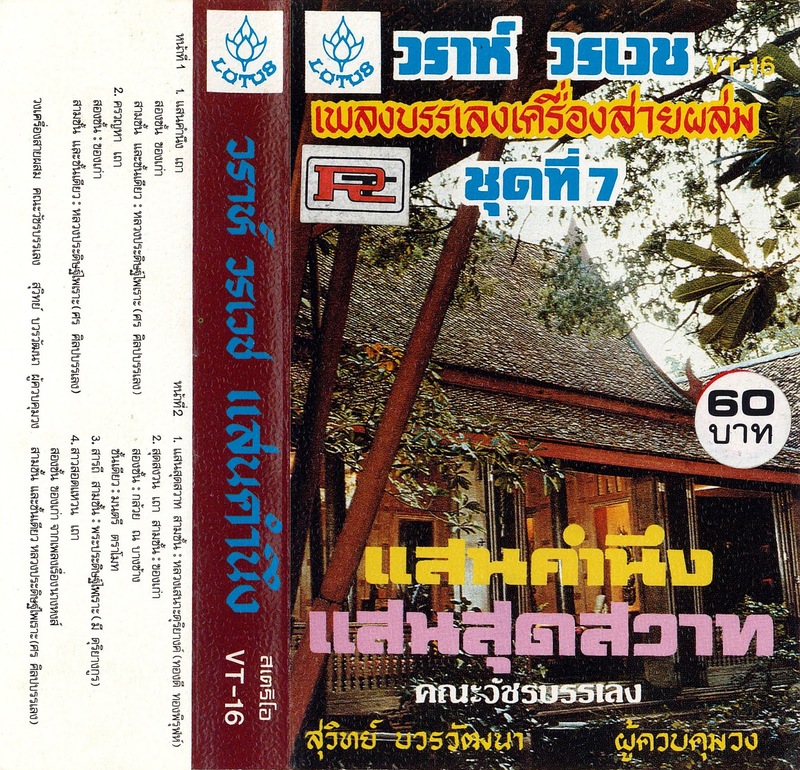 in particular, this recording features a khrueang sai phasom or "combined string" ensemble, conducted by suwit bowonwatthana, and based on the traditional thai string ensemble (which typical featured so u and so duang fiddles, chakhe plucked zithers, khlui flute and percussion). to my ear, the phasom aspect regards the addition of accordion, chinese-style dulcimer, and perhaps some other elements that a more astute listener than i could divine? the repertoire features work from a number of prominent thai composers including luang pradit phairo (son sinlapabanleng), luang sano duriyang (thongdi thongphirun), luang sano duriyang (thongdi thongphirun), montri tramot, and phra pradit phairo (mi duriyangkun), several of which are based on more ancient melodies and which in turn feature further arrangement by mr. wara.. enjoy! this cassette was a generous gift from our pal sam of the (now sadly defunct) archive of southeast asian music! 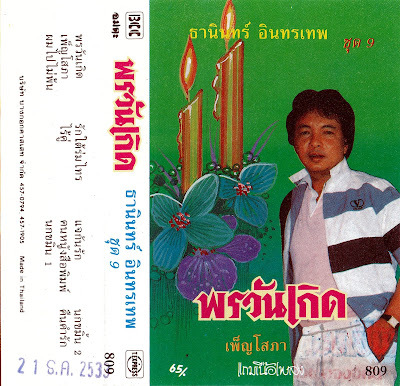 this week, more great 1980's thai city-pop! founded in 1970 by nakhon wetsuphaphon and friends at bangkok's bophit phimuk college, grand ex' (like last week's royal sprites) got their start playing at nightclubs and string combo competitions around the capitol. the group carved out a niche for themselves by eschewing the hard rock image popular with other local groups, preferring a straight-laced look complete with dress shirts and neckties. they went through a range of personnel changes before settling on a line-up with chamrat sawetaphon (who would later found the ubiquitous new-age label green music) on lead vocals and starting their recording career. this cassette contains their 14th album, from 1984, wherein the group build slick, jazzy, electronic disco-crossover songs out of older classical and luk krung melodies. enjoy! this week, some classic thai funk! originally styled the royal academy of magic sprites, today's group was founded in 1969 by lead guitar amnat sima and singer adisak prakhunhangsit while they were studying at the poh-chang academy of arts. they played at nightclubs and string combo competitions around bangkok, in friendly rivalry with fellow pop/rock groups like the impossibles. toward the end of the 70s, adisak left the group and sunthon sutcharitchan came on as lead vocalist, whereupon they took on a more funk/disco bent and also began their recording career in earnest. they released a string of successful albums up until 1987, when they disbanded. the cassette featured today was their first for the azona label, released in 1982. enjoy! 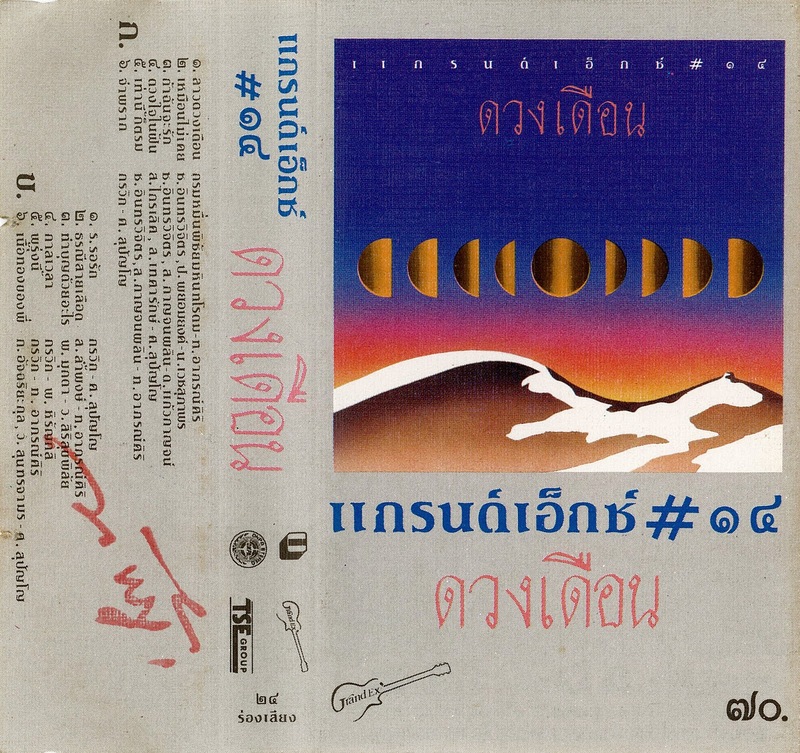 back in may, we had a great compilation from the first decade of luk thung/molam star chinthara phunlap's career.. this week, we'll hear an entry from a half-decade later! for a quick refresher: chintara came from a farming family in roi-et province and worked her way up through singing contests and radio appearances in khon kaen, before signing to gmm grammy and quickly becoming a best-seller. her high tone and ornamented style of singing have earned her the nickname "the girl with the voice of a phin", and her short haircut and energetic presence made her an icon of her generation. 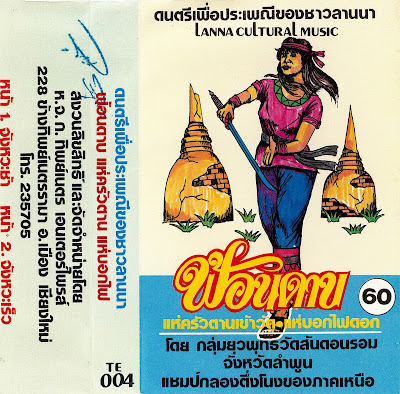 this cassette is the third in her "molam sa-on (pleasing molam)" series, released on her own mastertape label in the year 2000, featuring songwriting from dao bandon and music from sawat sarakham. enjoy! this week, a solo outing from the famed winai phanthurak! a saraburi native, winai got his start as a vocalist in one of phayong mukda's youth chorus projects before moving up to be an instrumental contributor to p.m. pocket music, phayong's shadow prayuk or "modernized" thai music ensemble. from there, he teamed up with settha sirachaya to form the impossibles, thailand's pre-eminent smooth 70's vocal/funk group. after they split up in 1977, winai joined rewat phutthinan (future head of gmm grammy) to form a band called the oriental funk. where, through all these comings-and-goings, did this particular album fall? i'm not exactly sure, but it bears the hallmarks of his erstwhile career, with a lightly funk-informed MOR sound dominating. interestingly, the selections all date from a generation or so previous, compositions of early luk krung songwriter and accordion star luan khwantham. on the musical side as well, the band keeps things interesting with some left-field moog-ish stabs. and speaking of left-field, the cassette also includes alternate (though clipped) beardless cover art of winai. as per your taste, i suppose.. enjoy! 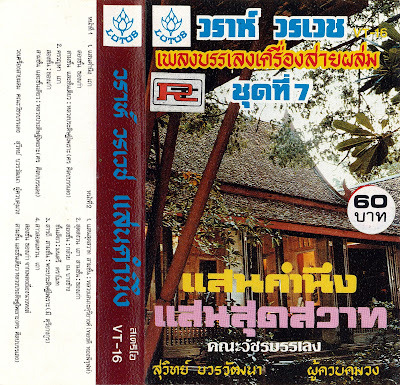 this week, a collection of classic ubon luk thung hits redone by a roster of the city's favorite sons & daughters, circa.. year 2000? the liner notes don't make it exactly clear, but the project seems affiliated with the ubon ratchathani rajabhat university in some way.. its president, asst. prof. somchai wongkasem is listed as the producer, and the architecture of the university's impressive cultural centre graces the front cover. a commemorative keepsake of some sort perhaps? regardless.. enjoy! this week, i'll be sharing another collection of golden-age luk thung from chatri sichon! (we've had one with an identical title before, albeit a different tracklist, so apologies to everyone trying to keep their discographies straight). 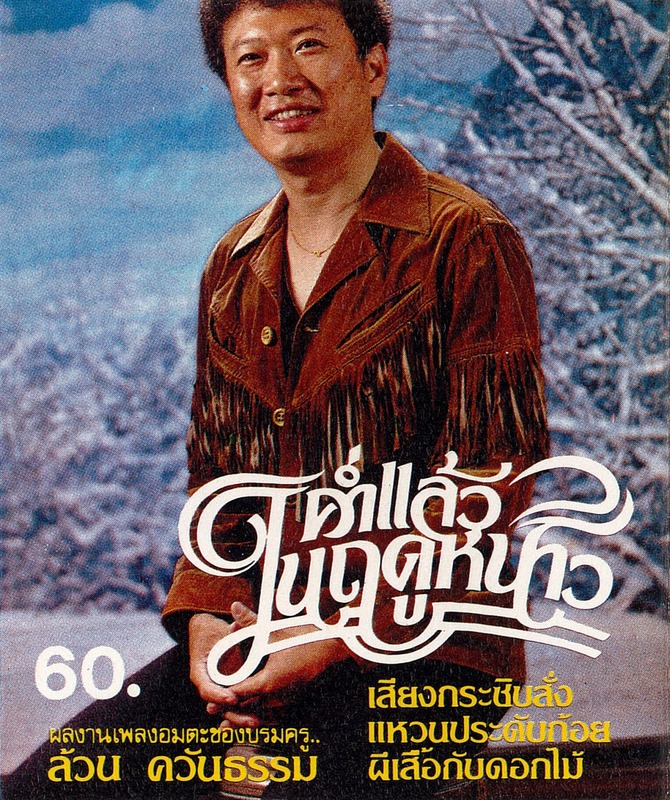 chatri, from chonburi, got his start in samniang muangthong's ruam daokrachai band, but left to help suraphon sombatcharoen's wife sinuan rehabilitate their band after her husband's murder in 1968. in that role he was primarily a songwriter, but within a year chatri had founded his own band and cut his first records. this cassette features some those early tracks, propelled by wheezing accordions, hand-drums and chatri's own rough-cut vocals. the b-side features some harder-to-find songs of his, heavy on liké breakdowns and other folk-song flourishes. enjoy!! this week's post marks the tenth in a series of cassettes gifted to us by educator cliff sloane, former professor of ethnomusicology and founder of asianclassicalmp3.org, a major influence behind this blog. 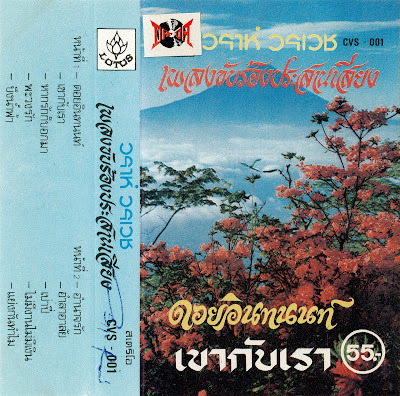 on our tenth tape from cliff, we've got 2 whole sides of non-stop northern thai percussion! 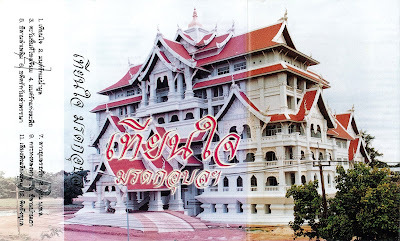 our players today are from the young buddhist association of wat sandonrom in lamphun province, hailed on the cover as "champions of klong tueng nong in the northern provinces", klong tueng nong being the extremely long, deep drums (often 2 or 3 meters in length) which are accompanied by a team of cymbals and bossed gongs. the j-card also suggests proper settings for the music presented here, including sword dances, money-tree processions and firework displays. side one is slow, side two is fast.. enjoy! this week, a three-and-a-half-hour molam extravaganza! our recording today features the luk thung dao duang mai group in a performance from 1994, spinning the tale of ''the drunkard son-in-law & the venerable old gambler'', in an ubon-style lam, over a 4-cassette set from ratchabut stereo. the action unfolds as our troupe of molam enact their comical speak-singing routines between full-band lam phloen dance numbers, with prominent synthesizer displays. enjoy! this week, some peak millennial luk thung from miss dao mayuri! dao got her start in bangkok, the child of immigrant parents from amnat charoen province in isan. she began her singing career after graduating from the siam commerce technology college, originally performing molam-tinged luk thung isan under the name yuphayong yot-ubon. she soon changed her style and stage name, jumping between a few different labels before eventually ending up in the r siam camp, with whom she released this cassette in the year 2000. the songs feature a classic luk thung backdrop, inventively adorned with suntharaphon-esque violin, chinese zither, bollywood-style strings and effects-laden guitar leads. enjoy! this week, some great molam prayuk from sianglaem kaemmumang! 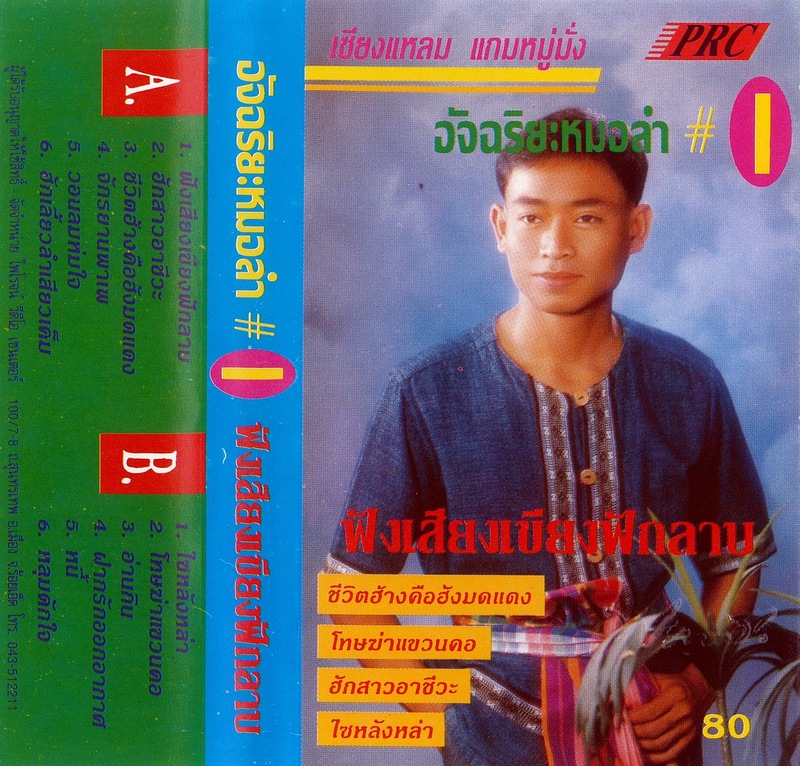 i don't know much about mr. sianglaem (real name: bunthiang suepsunthon), but a helpful youtube commenter1 has identified this album as classic "kalasin-style", and the album is brought to us by the phairot phanit company out of neighbouring roi-et province, which seems to situate the music fairly efficiently. 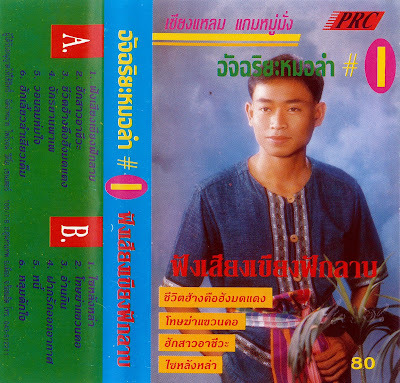 from a quick survey online, it looks like sianglaem was still performing, as part of the laemnarong promotions group, as recently as 2013. the singer is author of most all the lyrical content on this 1996 cassette, and music is provided by the consistently excellent a. num phuthai. enjoy! this week, mixed chorus meets thai funk! 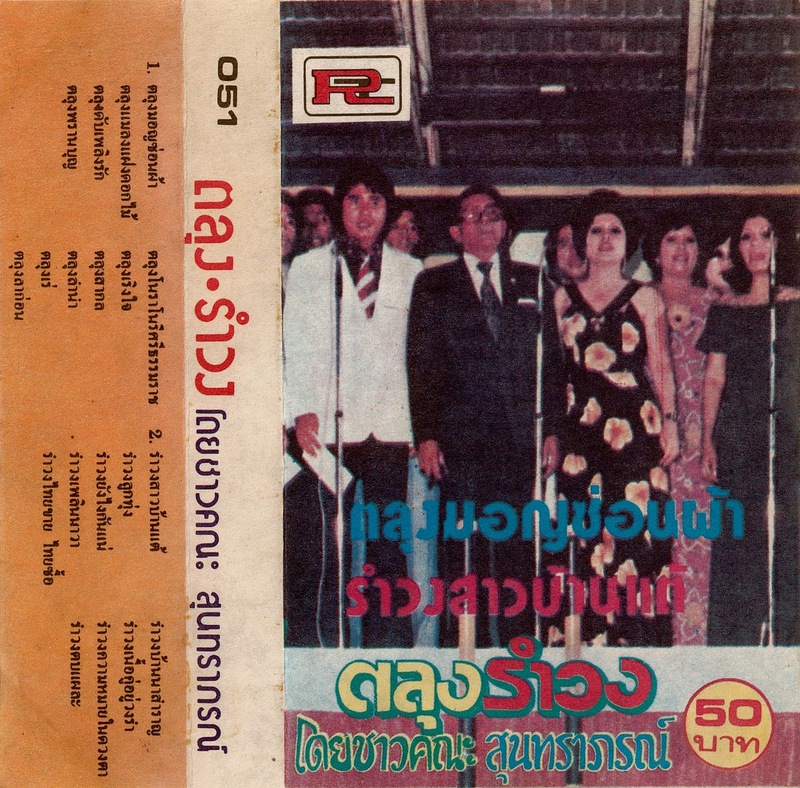 our featured artist today, wara worawet (a physician by profession, graduating from the university of pennsylvania in 1961) is also a prolific songwriter, having a number of luk krung & thai sakon-style hits to his name, as well as a leader of the musical association of thailand under patronage of his majesty the king. 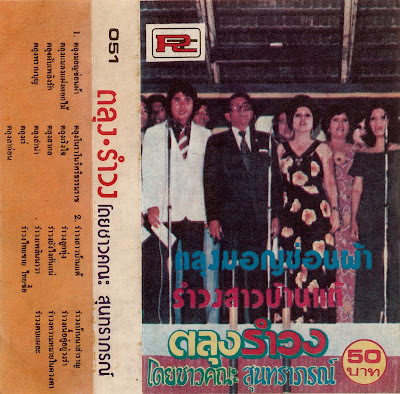 this cassette features the university choir-style harmonies which seemed to be all the rage in 1970s bangkok, mixed with the light & airy thai funk style also popular at the time. enjoy! this week, we'll hear some hi-nrg 90s luk thung sounds! little-known today, miss phimchan had some regional success in the northeast, particularly with this cassette's single, the lone ballad among an album of driving disco. i haven't been able to track down much in the way of biographical details, but the album's cover sells her as sao siang kangsadan, "the girl with the voice of a moon-shaped bell". thanks also to the j-card, i can tell you that her album was a project of olan noichoi (a.k.a. mu rota), with prayong chuenyen and num phuthon along for words & music. but that's about it.. enjoy! this week, a "far east"-accented entry from a luk krung veteran! mr. suthep wongkamhaeng of khorat (nakhon ratchasima) left his career in visual arts to join the royal thai air force band, after being spotted gigging as an intermission performer at bangkok movie theatres. following his tour of duty, suthep became a staple in the most popular of bangkok nightclubs and appeared frequently in mid-century silver screen musicals. the songs on this album, "in remembrance of tokyo", date from around 1960, when the star singer returned home after a 3-year hiatus to revisit his first love of visual arts; touring japan to study that nation's local painting traditions. as you may imagine, a sweet, sorrowful enka sound results, in addition to the typical luk krung thai-latin and crooner affairs.. enjoy! this week, dance-ready rhythms of talung and ramwong from thailand's preeminent mid-century urban entertainers! the suntharaphon band was an outgrowth of the government public relations department band. 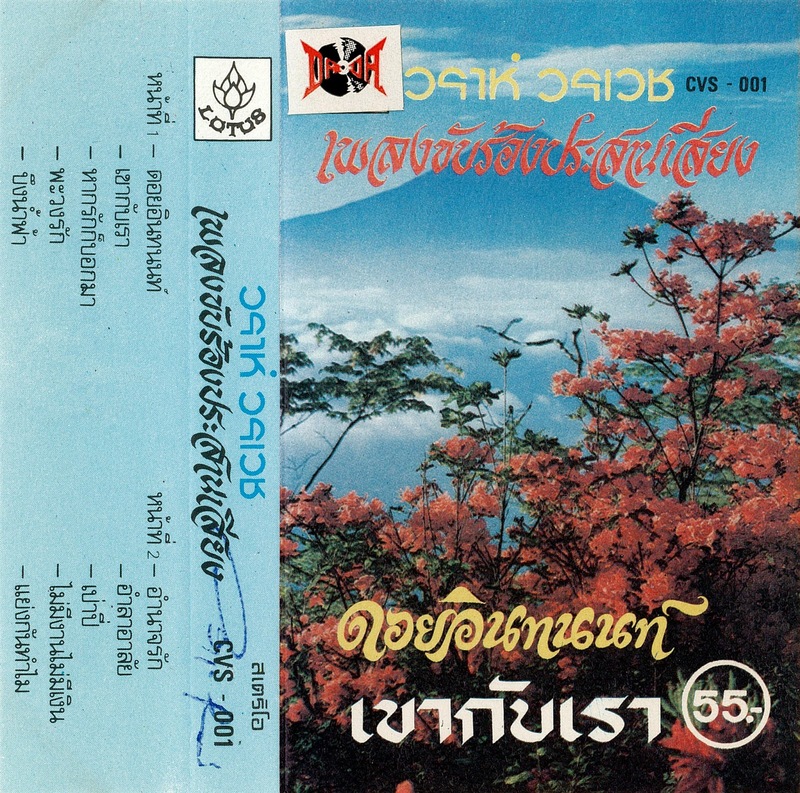 geared for the dancehalls of 1950s bangkok, the group played a leading role in popularizing the genres featured on this cassette; inspired by the captivating folk rhythms of south (talung) and northeast (ramwong) thailand, these two state-sponsored steps were intended as local responses to the international dance crazes sweeping thai popular culture at the time, and can still be heard pumped into public areas via p.a. systems any time a traditional holiday rolls around. enjoy!